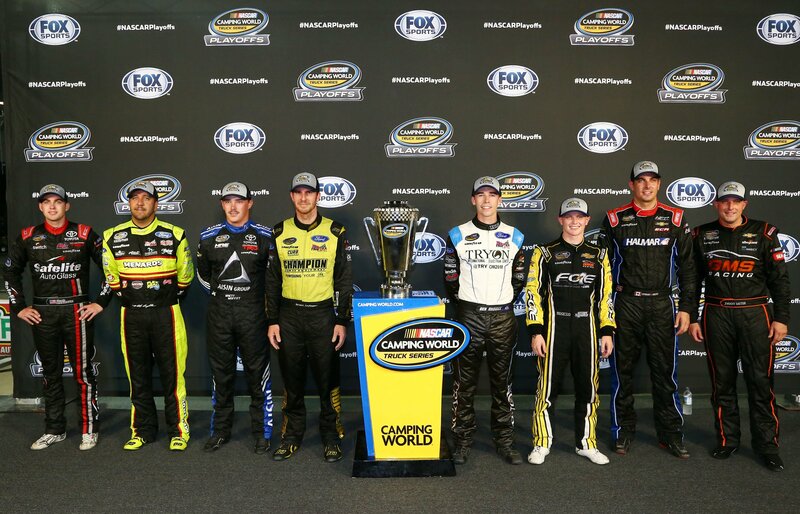 It’s the regular season finale for the NASCAR Camping World Truck Series. 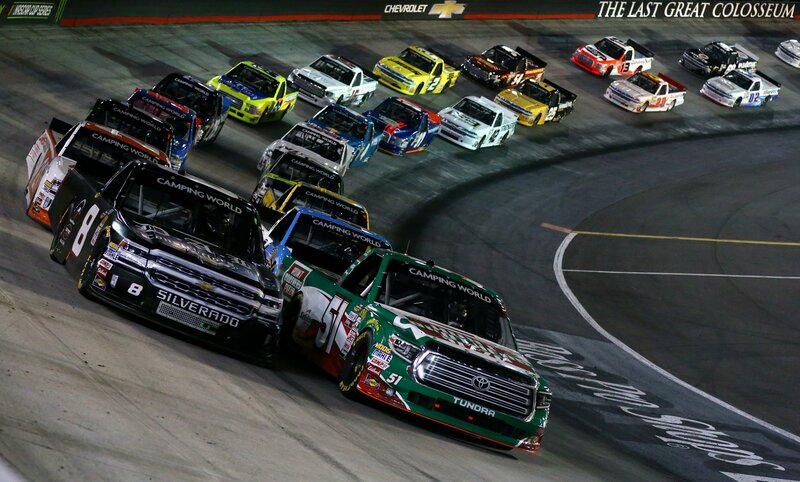 Did your sorry excuse for a tv provider show a football game instead of the Bristol night race? Yes, that happened for many. I got you covered. Christopher Bell and Ben Rhodes will lead the field to the starting line. Bell is the substitute driver for Harrison Burton who became ill during the week. It’s the first career race for Stefan Parsons. Green flag, Bell gets the jump. Bell leads by three truck lengths into turn 1. Rhodes falls to 3rd heading into turn 1. Lap 13, Scott Lagasse Jr is around off turn 4. The caution is out. Green, Bell leads into turn 1. John Hunter Nemechek is working the middle lane. He’s been there for the whole race. He’s hanging on the right rear of the leader of this restart as Rhodes gets shuffled back a few more spots. Lap 26, Cory Roper is around. Jordan Anderson helped with that effort. Green, Bell noses ahead into turn 1. Nemechek is hanging right there with him this time. Nemechek pulls even with Bell off turn two. Nemechek has the momentum off the high side, he carries to the lead into turn three. 7 to go in stage 1, Johnny Sauter takes over 2nd on the bottom. He used the bumper on Enfinger off turn four. Nemechek sits a full 2 seconds up the track. 2 to go, Sauter has closed the gap to 1.2 seconds. John Hunter Nemechek wins stage 1 in the Truck race at Bristol! The field hits the pit lane. Sauter is first in and first off with four tires. Brett Moffitt is off 2nd, fuel only. Moffitt pitted 20 or so laps ago. Nemechek and Sargeant stayed out on the race track. Green flag, Nemechek leads into turn 1 on the outside. Todd Gilliland is around. His truck just snapped off the bottom and went around on it’s own. Gilliland has collected a piece of Jesse Little on his way up the banking. Green, Nemechek leads by four truck lengths into turn one. Little has a major tire rub. They are calling him to pit road under green. 8 to go in stage 2, Nemechek leads Sauter by 8 seconds. 3 go go, Noah Gragson and Todd Gilliland make light contact. Gilliland ran right into his rear bumper at the flagstand. Gilliland is a lap down. The next lap, Myatt Snider is around at the flag stand, he makes heavy contact with the inside wall. Myatt was also battling with Gragson, he was pinched off turn four. 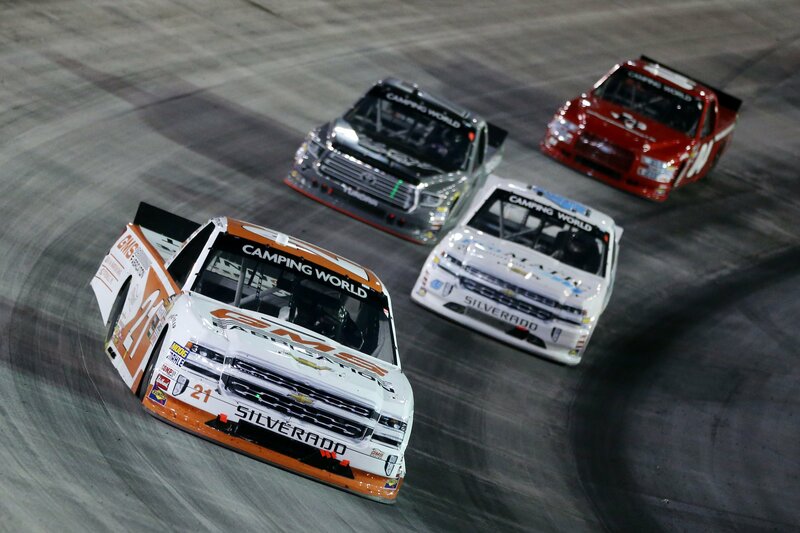 John Hunter Nemechek wins stage 2 in the truck race at Bristol! Sauter leads them to the pit exit. Gragson takes two tires and heads out second. Nemechek falls from 1st to 4th. Green flag, Sauter and Gragson run even into turn 1. Gragson powers by on the outside of turn 2, he leads into turn 3. 70 to go, Gragson is fading. Sauter looks to the inside off turn corner, he takes the lead with ease. 60 to go, Sauter leads Nemechek by 0.4 seconds. A lap truck helps him open it back up to 1.2. 40 to go, Christopher Bell is slow on the race track. He’s lost power steering. Bell heads to pit road under green. 30 to go, Sauter is deep in lap traffic. Nemechek is coming in a hurry. The leaders run nose to tail! Sauter checks out as the lappers run side by side ahead. Nemechek gets into his back bumper! Sauter holds the lead. 24 to go, the lap cars continue to run side by side. Nemechek rolls to the outside lane. They run side by side for the lead. The bottom lane isn’t moving. Nemechek claims to the lead at the outside lane of lap cars moves a little quicker. 12 to go, Nemechek has caught another pack of lap cars. Friesen and Sauter run three wide with the lap cars for 2nd. Friesen takes the position. Sauter puts the bumper to him and retakes the spot! 8 to go, Nemechek leads by 2 seconds. 5 to go, Nemechek leads Sauter by 0.3 seconds. Nemechek has a problem! Sauter takes the lead! Friesen has a look to the inside of Sauter. He’s pinned behind a lap car, Sauter opens up the gap. 1 to go, Sauter leads Friesen by two car lengths. 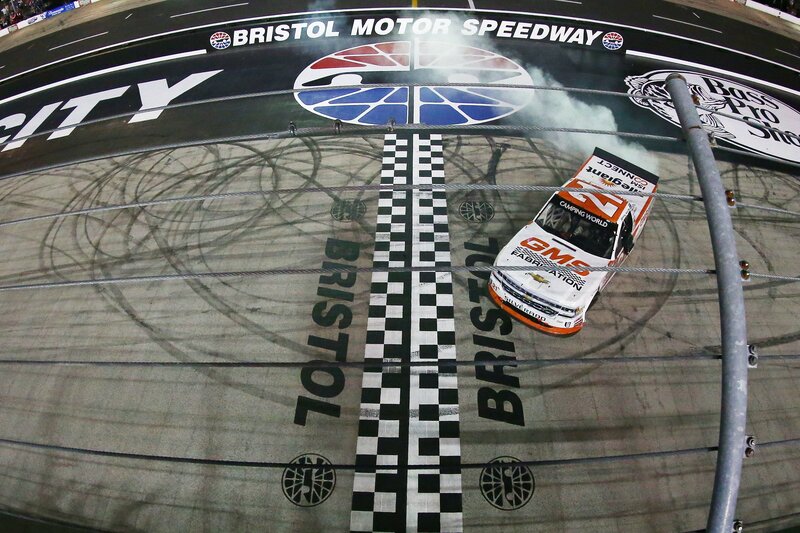 Johnny Sauter takes the NASCAR Truck Series win at Bristol Motor Speedway! 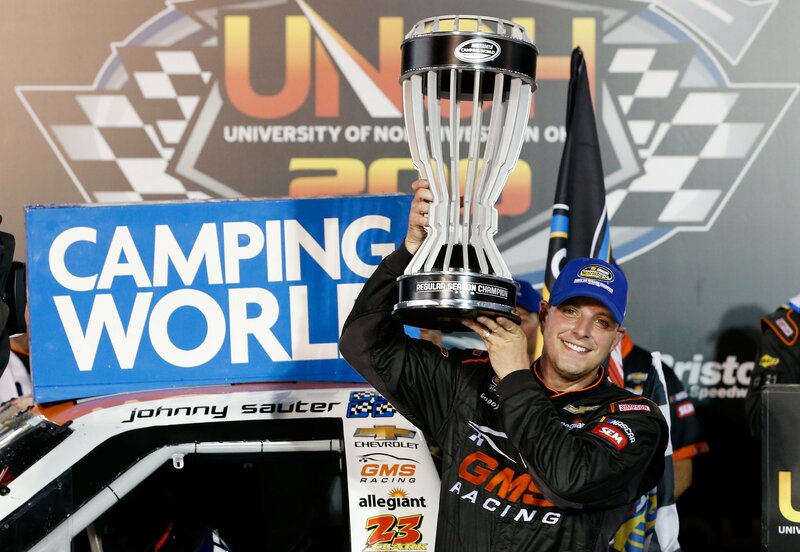 Sauter will also be crowned the 2018 regular season champion in the NASCAR Truck Series. View full 2018 Bristol Truck results below.